If you think that the perfect steak is determined solely by the precision of grill marks, there's a strong possibility that you may be falling into one of the 6 sins of grilling steaks. There are certainly many different ways to prepare a delicious steak, but there are several foundational rules that should be followed every time you grill. Unfortunately, the outdoor kitchen owners and grillers who are not aware of these "rules" end up committing some serious steak sins. Let's look at those 6 sins so that you can avoid them the next time you're tempted to grill. The most common reason that steaks end up overcooked is because people don't realize that a steak continues cooking even after you remove it from the grill. The best way to avoid overcooking your steak is to slightly undercook it. Not all steaks are created equal. You should shop carefully to ensure that you buy the best cut of steak. Choosing an aged steak is a great way to guarantee that your steak is flavorful. How old is the ideally aged steak? Most chefs recommend 15-30 days. 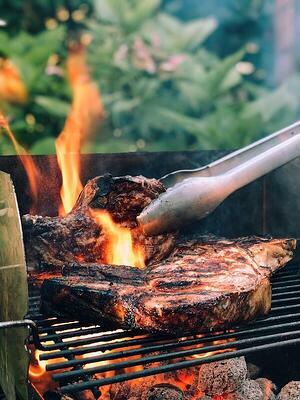 Some of the best grill masters and chefs will tell you that the key to a good steak is simply fire and salt (medium grain sea salt, that is). As long as you've selected a high quality cut, it should be tender and flavorful without going overboard on marinades and rubs. Focus on learning one thing at a time. Start with salt and master your grilling techniques; then, later you can spend some time experimenting with flavors. The best time to season your meat is right when you pull it out of the refrigerator. This gives the salt ample time to sink into the meat so that the flavor cooks through. If you don't have at least 40 minutes to let the steak season and set, then you're better off seasoning it right before you put it on the grill. Salt that sits on your steak for less than 40 minutes will end up having the opposite effect you're going for; it will actually pull moisture out of your steak. It's best to let your steak reach room temperature before tossing it on the grill. This waiting period also gives the steak time to dry out. The drier your steak is when you put it on the grill, the crisper the outside crust will be and the better it will hold moisture inside. Also make sure your grill is super hot. The source of your heat will affect the flavor or your steak. Your best option for the tastiest steak is using hardwood or hardwood lump charcoal. Not a charcoal person? Propane is your second best option. You should only flip a steak once. Flipping it too often messes up your grill marks. Unless you've grilled literally thousands of steaks, don't even think about trying to press on them to test doneness. You may be pushing on a muscle knot and wrongly assume your steak is less done that it actually is. Consider a meat thermometer your best friend. There's no shame in using one to perfectly prepare your steak; the real shame is in serving up a poorly prepared steak because you didn't use one.